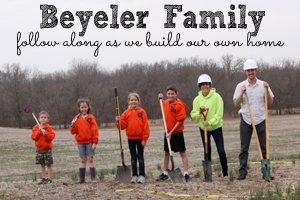 Building Beyeler Hollow: Day 14: Happy Easter! Sunday No work today, Sunday's a day of rest. Thank goodness. It's been a busy few weeks and I'm grateful for the chance to rest. We feel very blessed to have the opportunity to be building. It would not be possible without the help and support of so many. Most importantly, nothing would be possible without Him. Please take a moment this Easter to reflect upon our Savior Jesus Christ.